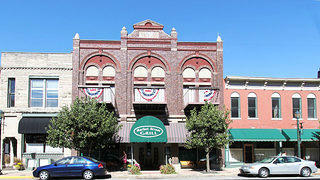 The historic core of downtown Wabash, Indiana, is just about four square blocks. Brick and limestone commercial buildings, dating to the 1880s or the turn of the century, stand side by side along the streets. The town may be small—about 11,000 people call Wabash home today—but its residents are determined to bring its historic downtown back to the vibrant center it used to be. During the first half of the twentieth century, the downtown was a popular place full of local businesses offering a variety of services to the townspeople. “It was the crux of the community,” explains Steve Downs, executive director of Wabash Marketplace, a volunteer-driven nonprofit spearheading efforts to improve the downtown. Then industries began moving out. When the local tire factory closed, 800 Wabashians lost their jobs. “Stores started moving out to the strip malls and the downtown area was left with a core of empty buildings. When the buildings are empty, they’re not being taken care of.” This downward spiral, Downs notes, is not unusual for small communities, but that doesn’t mean Wabash needs to accept it. Wabash Marketplace was founded in 1981 with the goal of bringing economic prosperity to Historic Downtown Wabash. Its mission is based on the Main Street Four Point Approach. The organization remains small, with just two paid employees and a 15-member board of directors who are residents and have an interest in the downtown. “The whole community sees the downtown as an important cog to keep Wabash going,” says Downs. Over the past few years, Wabashians have already seen changes to the town's historic core. Young businesses have moved into historic commercial buildings left vacant or in disrepair. They, along with local foundations and Wabash Marketplace, collaborate on events, including a weekly farmers’ market and monthly First Fridays that bring live entertainment, food, and shopping to the streets. 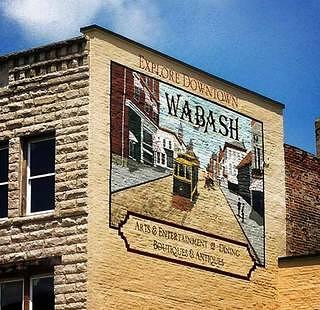 Wabash's historic district is made up of about 100 buildings. 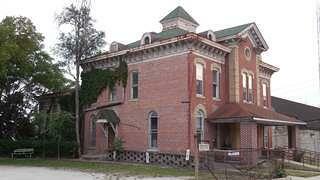 The Wabash Sheriff's House & Jail, once listed on Indiana Landmarks' 10 Most Endangered, was purchased in 2017. 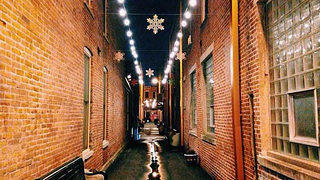 The town decorates some of its historic streets for local events. 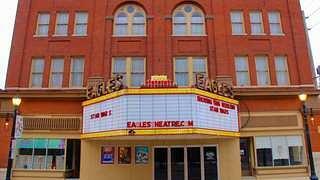 The Eagles Theatre is a beloved local landmark. The goal, Downs says, is to keep people aware of the downtown. One ingredient of the town’s recipe for revitalization is Historic Tax Credits (HTC). “Property owners love them,” says Downs. Downtown Wabash is listed on the National Register, and so all of the buildings qualify for HTC. Wabash Marketplace works with property owners to bring awareness of the tax incentive, which (as of now) offers a 20 percent income tax credit for the rehabilitation of commercial buildings. Another ingredient is the facade improvement program that Wabash Marketplace began in 2014. The nonprofit received $1.3 million to offer as matching grant funds for downtown building owners to spend on improving their facades. “Right out of the box, we have 22 businesses involved. By the time we are done, they’ve put in private investments in excess of $32 million. [The facade improvement program] has definitely been the impetus," Downs explains.